Finally its goodbye to my cherished mk1.5 2.0 esp, after 9 memorable yrs with bullet proof reliability & lots of fun,i welcome to my mk2.5 titanium. Please each pics will be at different stages. Looking good yunni , are you pleased with it? , what other plans do you have for it? Love it , rims are banging mate!! Are they replicas? Very smart !! How much more have you got planned! you are in the exactly the same boat as me on this, even the same car and colour :-P you just have a push start and I don't :-( !!! How many LEDs are on the reg plate ones please (the brighter one) ?? Eibach springs to make car sit better, even with 18's its like on stilts. twin reverse mod, easy as i did on my mk1.5. St225 led rear lights ,the genuine ford ones. interior lights are sorted , now all leds. i'll leave it for that for now lol! No mate, genuine ford with RONAL stamped on it, i was temted to go for replicas, but came across these. the diffuser does sit over the existing bumper. Love it (Y) can't wait to see more. 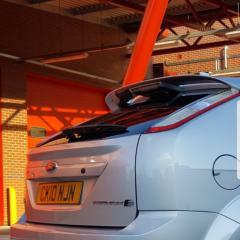 i was looking at that one from the same seller & thought the bumper is different as it has a lip & not flush like the stock one.but thanks for early warning, i am weary before i buy, i generally ask tech gurus on say here,ffoc focusowners etc.so can you tell me which one would fit on stock bumper with hardly any modifications? I am the same!!! Items sit in my watch list for about a month before I go for them lol! do you see what i mean about the rear skirt attatched. Agree with Charlie, fibreglass parts tend to be cast from moulds made from original parts therefore any inaccuracies of the mould translate to the castings. There's a Polish seller on eBay that sells cast parts and the quality and fit is apparently shocking. Ooh I may have to spray my washer jets !!! +1 and purchase a set of those wind deflectors, oh Want! !